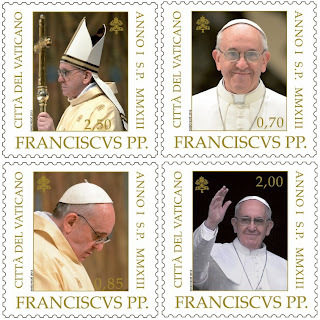 The four stamps in the set, which reproduce photographic images of the new pontiff, have the values of: €0.70 (for mail to Italy); €0.85 (Europe); €2.00 (Africa, Asia, the Americas); and €2.50 (Oceania). There will be 250,000 complete series printed. The Philatelic and Numismatic Office will issue, along with the stamp series, a stamp and coin card and an official collector’s edition folder with the four stamps and a postcard of the first page of the extraordinary edition of the Vatican newspaper, L’Osservatore Romano, from 13 March 2013 (the day of the new pontiff’s election).